Barkworthies Big Cheese Chews offers your aggressive chewer a long-lasting, tastier alternative to rawhide! Based on a generations-old recipe from the mountains of Nepal, these all-natural, nutritious chews are made from yak and cow milk. 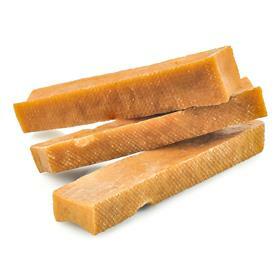 Barkworthies Big Cheese Chews last up to 5 times longer than your average rawhide chew. They are completely digestible and grain free. Just like the rest of the Barkworthies line, they don't contain any additives, chemicals or preservatives.